Gunnison Valley RTA | We Move You! Para información en español, por favor desplácese hacia abajo. Please scroll down for the current bus schedule. The RTA bus runs a loop through the City of Gunnison before heading north on Hwy 135 to Crested Butte and Mt. Crested Butte. The bus leaves the following stops NO EARLIER THAN the times listed. There may be delays due to weather. THE TRIP BETWEEN GUNNISON AND CRESTED BUTTE TAKES ABOUT 40 MINUTES. In Crested Butte and Mt. Crested Butte, you can get around by connecting to the Mountain Express free bus service. The bus does not stop at the Gunnison – Crested Butte Regional Airport and the buses are not equipped to handle any baggage other than carry on items. Baggage other than ski / snowboard equipment and carry on items are not allowed on RTA buses. For airport service, please contact Alpine Express, Rocky Rides, CB Limo, and / or Dolly’s Mountain Shuttle. Click HERE for our real-time predictions map. You can use this map anywhere to see where our buses are and when they will arrive at your stop. Select the direction you are going and the bus stop you are at from the drop-downs on the left to see when buses will arrive. The RTA also has real-time arrival information available for smartphones. 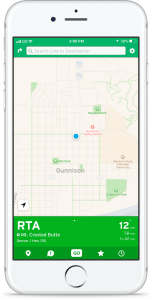 If you have a smartphone, please consider downloading the Transit app which is available for Android and IPhone. Click this link or on the image below to download the app. For more information, please call Alpine Express at 970.641.4111. DECLARACIÓN DE DERECHOS DEL PASAJERO De acuerdo con las disposiciones del Acta de Estadounidenses con Discapacidades (ADA por sus siglas en inglés) y el Acta de Derechos Civiles del 1964, la agencia RTA no discrimina en contra de ninguna persona en base a su discapacidad física, raza, color de piel, nacionalidad, orientación sexual o género. Para obtener más información sobre los estatutos o para presentar una querella, ponerse en contacto con el coordinador de RTD responsable de los Derechos para los Discapacitados y Título VI, Scott Truex, Director Executive, PO Box 39, Crested Butte, CO, 81224 o llamar al struex@gunnisonvalleyrta.org. Para servicios de retransmisión para personas con discapacidad auditiva, llamar al 1-800-659-2656. Para ayuda en español, por favor contactar 970-404-1930. Las personas ciegas tendrán derecho a usar perros asistentes siempre que sea necesario de acuerdo con lo definido y establecido en las directrices de ADA.